^ Cells : building blocks of life. Maton, Anthea. (3rd ed.). Upper Saddle River, N.J.: Prentice-Hall. 1997. pp. 70–74. ISBN 978-0134234762. OCLC 37049921. 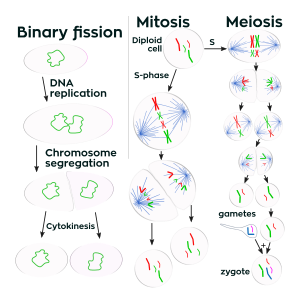 ^ Cell division : theory, variants, and degradation. Golitsin, Yuri N., Krylov, Mikhail C. New York: Nova Science Publishers. 2010. p. 137. ISBN 9781611225938. OCLC 669515286.